Background: Ovarian cancer (OC) is one of the most common cancers among women in the world. This study aimed to compare the results of endometrial and endocervical cytology with the ultimate outcome of the uterus, ovary, and fallopian tube (derived from hysterectomy or salpingo-oophorectomy) in diagnosing endometrial hyperplasia, endometrial, and OC. Materials and Methods: This cross-sectional study was conducted on 30 women with endometrial hyperplasia, 90 cases of endometrial cancer, 30 cases of OC, and 30 normal controls undergoing hysterectomy or salpingo-oophorectomy referring to Al-Zahra and Shahid Beheshti Hospitals in 2015–2017. Their basic and clinical characteristics were recorded, and then, endometrial cytology was performed by a specialist and sent to a pathological center. Results: Diagnostic value of cytology showed that out of 90 individuals with endometrial cancer, 78 (86.7%) ones were positive and 12 (13.3%) were negative with sensitivity and specificity of 86.67% and 100%, respectively. Its positive predictive values (PPVs) and negative predictive values (NPVs) were 100% and 71.4% (AUC = 0.933; P < 0.0001). In diagnosing endometrial hyperplasia out of 30 individuals with endometrial hyperplasia, there were 24 (80.0%) positive and 6 (20.0%) negative with sensitivity and specificity of 80.00% and 100%, respectively. Its PPVs and NPVs were 100% and 83.3%, respectively (AUC = 0.9000; P < 0.0001). In diagnosing, OC cytology could not detect any one of the 30 individuals with OC, with sensitivity and specificity of 0% and 100.0%, respectively. Its PPVs and NPVs were 0% and 50%, respectively (AUC = 0.500; P = 1.00). Conclusion: Cytology has a good diagnostic value for detecting endometrial hyperplasia and endometrial cancer compared to pathology; however, due to very low sensitivity in detection of OC, it could not be considered as a good diagnostic tool. Ovarian cancer (OC) is the 11th most common cancer in women, and is the fifth leading cause of death from cancer in women, and is the deadliest cancer in women. The risk of this cancer is 1 in 79 in the lifetime of a woman and the risk of female mortality for OC is 1 in 109. This cancer is not usually diagnosed in the early stages of the disease, whereas if it is diagnosed at an early stage, it will have good prognosis. One of the diagnostic methods is transvaginal sonography. Furthermore, A cancer antigen-125 (CA-125) test measures the amount of the protein CA-125 in patient's blood. A CA-125 test may be used to monitor certain cancers during and after the treatment. In some cases, a CA-125 test may be used to look for early signs of OC in people with a very high risk of the disease. Although in these diagnostic methods, lesions such as low-grade serous carcinoma, endometrioid, clear cell, and ovarian mucinous carcinomas can be diagnosed, high-grade serous carcinoma (HGSC) tumors are not well detected in the early stages. Given that the most common and deadliest type of OC is HGSC, early diagnosis of these lesions is quintessential to reduce the risk of death from OC. Since the cells are intrusive in this type of cancer, they can be diagnosed by endometrial cytology and cervicovaginal cytology when these cells enter the endometrial cavity from the Fallopian tube More Details. In the previous studies, it has been shown that more than 20% of OCs are diagnosable by cytology; in addition, the diagnostic value of cytology has been higher in patients with a family history of breast or OCs. Moreover, according to the results obtained from a bulk of studies, endometrial cytology has been able to predict the carcinoma of the fallopian tube or the hysterological OC.,, However, the accuracy of this method has not yet been proven in identifying types of OC, and so the researchers are looking for a helpful diagnostic method that will lead to the early identification of this cancer so that they can reduce the mortality rate. On the other hand, one of the major concerns in women, especially for gynecologists and midwives, is endometrial disease, which includes a wide range of benign endometrial diseases such as endometrial hyperplasia and endometrial cancer., The gynecologic malignancies are fatal in women since most patients are diagnosed with advanced stages. At present, the diagnostic methods, such as biopsy, hysteroscopy, transvaginal sonography, saline sonohystrography, and cytology, are used to identify endometrial diseases such as hyperplasia and cancer. The accuracy of the biopsy method is 90%–98%, and if used in conjunction with the other diagnostic methods mentioned above, it can be more accurate and more sensitive.,,, Nowadays, Pipelle outpatient biopsy, previously widely used in the assessment of abnormal bleeding and requiring admission and anesthesia, has been replaced by a dilatation and curettage technique. In this regard, a bulk of the previous studies has shown that endometrial cytology has a higher diagnostic power than hysterectomy biopsy and other diagnostic methods.,, Cytology can be a predictor of the grade of endometrial carcinoma or complement the outcome of preoperative biopsy in distinguishing Type 1 from endometrial cancer. The sensitivity and specificity of this method in these studies were reported more than 80% and had a positive predictive value (PPV) of more than 90% (21.22). However, it should be noted that if these diagnostic methods have false-positive results, they can lead to unproven medical intervention that has known complications and if there is a false-negative diagnosis, it may be along with progression and lack of proper treatment, especially for malignant and premalignant lesions. Therefore, comparing these methods should be taken into account with gold standard methods. Accordingly, the purpose of this study was to compare the results of endometrial cytology and endocervical cytology with the ultimate outcome of the uterus, ovary, and Fallopian tube (derived from hysterectomy or salpingo-oophorectomy) in diagnosing endometrial hyperplasia, endometrial cancer, and OC. The present cross-sectional study was conducted on patients undergoing hysterectomy or salpingo-oophorectomy referring to Al-Zahra and Shahid Beheshti hospitals in 2015–2017 (Isfahan, Iran). The patients were selected using simple random sampling technique and after insuring about no pregnancy and filling the consent form endometrial cytology was performed for all of them by a specialist. The patients were placed in the lithotomy position for cytology and without endoscopic anesthesia first, the endometrial brush was inserted into the cavity from the cervix and then, after brushing the endometrium, the sample was drawn and slipped onto the slide, as in the method used in Pap smear More Details. Patient's endometrial cytology was numbered and sent to a pathological center for examination and examined by an experienced pathologist. Diagnostic criteria of cytology reports are shown in [Table 1] based on new diagnostic reporting format for endometrial cytology. On the next step, they underwent hysterectomy or salpingo-oophorectomy by an expert surgeon, and the uterus or ovaries, or both, were sent to a single experienced pathology unit for pathological examination. If the samples were diagnosed as endometrial hyperplasia, endometrial cancer, and OC, they were included in the study; selection was continued until to reach to 30 women with endometrial hyperplasia, 90 cases of endometrial cancer, 30 cases of OC, and 30 normal controls were included in the study. If the results of the pathological tests were unsatisfactory (insufficient sample, discordance), or there were cervical, pelvic, or vaginal infections, or in the case of reluctant to continue to participate in the study, the patients were excluded from the study. It should be noted that the pathologist who cooperated in this study was not aware of the hysterectomy or salpingo-oophorectomy results. Finally, collected data were entered into SPSS software (version 20; SPSS Inc., Chicago, Ill., USA) and to evaluate sensitivity, specificity, PPV, and negative predictive value (NPV) of cytology comparing x pathology; we used receiver operating characteristic (ROC) analysis. The significance level in all analyzes considered <0.05. According to the results of the pathology, the study was performed on 30 normal women (without endometrial cancer and OC) with the mean age of 51.80 ± 6.39 years, 90 women with endometrial cancer with the mean age of 60.59 ± 5.73 years, and 30 women with OC with the mean age of 55.33 ± 14.32 years, as well as on 30 women with endometrial hyperplasia with the mean age of 51.20 ± 5.94 years. The evaluation of diagnostic value of cytology in comparison with pathology in diagnosing endometrial cancer showed that according to the cytology results, out of 90 individuals suffering from endometrial cancer, 78 (86.7%) ones were positive and 12 (13.3%) ones were negative [Figure 1]; however, all patients with normal status were diagnosed normal as well. Moreover, the sensitivity and specificity of cytology in diagnosing endometrial cancer were 86.67% and 100%, respectively. Its PPV was 100% and its NPV was 71.4% (area under the ROC curve [AUC] [95% CI] = 0.933 [0.873–0.971]; P < 0.0001) [Table 2]. The evaluation of diagnostic value of cytology in comparison with pathology in diagnosing endometrial hyperplasia showed that according to the cytology results, out of 30 individuals suffering from endometrial hyperplasia, 24 (80.0%) ones were positive and 6 (20.0%) ones were negative [Figure 2]; however, all patients with normal status were diagnosed normal as well. Moreover, the sensitivity and specificity of cytology in diagnosing endometrial cancer were 80.00% and 100%, respectively. Its PPV was 100% and its NPV was 83.3% (AUC [95% CI = 0.9000 [0.795–0.962]; P < 0.0001) [Table 3]. The evaluation of diagnostic value of cytology in comparison with pathology in diagnosing OC showed that cytology could not detect any one of the 30 individuals suffering from OC, 2; however, all patients with normal status were diagnosed normal as well. Moreover, the sensitivity and specificity of cytology in diagnosing endometrial cancer were 0% and 100.0%, respectively. Its PPV was 0% and its NPV was 50% (AUC [95% CI] = 0.500 [0.368–0.632]; P = 1.00) [Table 4]. The results of this study demonstrated that the sensitivity and specificity of cytology were 86.67% and 100%, respectively, that revealed the acceptable diagnostic value in the detection of endometrial cancer. In a study conducted by Okadome et al., on 198 patients with endometrial cancer who underwent endometrial cytology, endometrial biopsy, and then hysterectomy, they concluded that the sensitivity and specificity of endometrial biopsy in the detection of Type 1 endometrial carcinomas were 80% and 67%, respectively, whereas the sensitivity and specificity of endometrial cytology in the detection of Type 1 endometrial carcinoma were 90.4% and 70.3%, respectively. The sensitivity and specificity of endometrial biopsy for detecting type 2 endometrial carcinomas were 67.6% and 84.9%, respectively, whereas the sensitivity and specificity of endometrial cytology for the detection of Type 2 endometrial carcinoma were 70.3% and 91.8%, respectively. Moreover, 10 patients represented neither endometrial cytology nor endometrial biopsy in any atypical tissue or cell. Nine patients had no finding for cytology; however, their biopsy was positive, and four patients had normal biopsy but atypical cells were reported in their cytology. This study found that endometrial cytology had a higher diagnostic power than endometrial biopsy for detecting endometrial cancer and can predict grade of endometrial carcinoma or complement the result of preoperative biopsy distinguishing between Type 1 and Type 2 endometrial carcinoma. However, our study has not been evaluated the results of biopsy; it was consistent with our study regarding the high accuracy of the cytology for detecting endometrial cancer. According to this study, cytology was also considered as a good predictor for detecting grades of endometrial cancer. In addition, the evaluation of the diagnostic value of cytology compared to pathology for detecting endometrial hyperplasia showed that only six patients with this disease were not diagnosed by cytology; therefore, the sensitivity and specificity of this test were 80% and 100%, respectively. In addition, the NPV of this test to detect endometrial hyperplasia was more than endometrial cancer and had less accuracy in detecting endometrial hyperplasia than endometrial cancer; however, there was no preference for the accuracy of cytology to detect endometrial hyperplasia compared to endometrial cancer. In this regard, a study by Kaur et al. conducted on 21 patients with endometrial hyperplasia to detect endometrial hyperplasia. The endometrial cytology was able to detect 18 cases showing 87.5% sensitivity, 100% specificity, 100% PPV, and 96% NPV; hence, this result was similar to our present findings. Finally, cytology was not considered as a good diagnostic tool in the diagnosis of OC. Since it was not able to detect any cases of OC, although all normal cases were correctly detected, as was clear, this test had the lowest accuracy in the diagnosis of OC. In addition, contrary to the current study, Otsuka et al. 's study showed that the sample from endometrial testing could detect early-stage fallopian tube, ovarian, and peritoneal cancers. It was also found in this study that 23% of HGSC patients were identified in endometrial cytology, whereas other types of cancers such as 6% of low-grade serous carcinoma or mucinous were detected in cytology. In this study, 12% of the asymptomatic patients with ovarian, fallopian tube, or primary peritoneal cancer had positive endometrial cytology, which was three times that of the endocervical cytology. Even 40% of patients were diagnosed in early stage 0–2. It is also possible that endometrial cytology can be positive compared to others in the early diagnosis of ovarian pathology in women with a family history of either ovarian or breast cancer (BRCA mutation), which may be a great value in these patients. In addition, endometrial cytology revealed the malignant cells of the fallopian tube. Suzuki et al. 's study on 163 patients showed that 90% of cervical smears and 79% of endometrial smears could predict histologic type in OC. One of the strengths of this study is that it spends more time to focus our attention on collecting a certain number of normal patients or cases with endometrial hyperplasia, with ovarian and endometrial cancer, so that we can ensure accurate evaluation the diagnostic value of cytology because the previous studies were evaluated on a small and unequal sample of patients with hyperplasia, cancer, or normal, which small sample size of patients in each disease affects the diagnostic value of cytology. In contrast, the study's weakness may be the lack of diagnosis of OC by cytology, which could be due to a lack of sufficient researcher's experience or a lack of opportunity for further sampling. Therefore, it is recommended that in the future studies, the diagnostic value of cytology should be used to detect OC in a larger sample size to reduce the probable errors in the research process. The results of this study indicated that cytology had a good diagnostic value for detecting endometrial hyperplasia and endometrial cancer compared to pathology; however, it had a very low sensitivity in detection of OC and could not be considered as a good diagnostic tool for detecting OC compared to pathology. Chambers SK, Hess LM. Ovarian cancer prevention. In: Fundamentals of Cancer Prevention. Switzerland: Springer, Berlin, Heidelberg; 2014. p. 557-91. Olivier RI, Lubsen-Brandsma MA, Verhoef S, van Beurden M. CA125 and transvaginal ultrasound monitoring in high-risk women cannot prevent the diagnosis of advanced ovarian cancer. Gynecol Oncol 2006;100:20-6. Jayson GC, Kohn EC, Kitchener HC, Ledermann JA. Ovarian cancer. Lancet 2014;384:1376-88. Ferenczy A, Gelfand MM. Outpatient endometrial sampling with endocyte: Comparative study of its effectiveness with endometrial biopsy. Obstet Gynecol 1984;63:295-302. Byrne AJ. Endocyte endometrial smears in the cytodiagnosis of endometrial carcinoma. Acta Cytol 1990;34:373-81. Suzuki M, Suzuki T, Matsuura M, Iwasaki M, Tanaka R, Ito E, et al. Prediction of histologic type and lymph node metastasis for advanced ovarian cancer on uterine cervical and endometrial cytology. Acta Cytol 2010;54:575-81. Parazzini F, La Vecchia C, Bocciolone L, Franceschi S. The epidemiology of endometrial cancer. Gynecol Oncol 1991;41:1-6. Clarke-Pearson DL. Clinical practice. Screening for ovarian cancer. N Engl J Med 2009;361:170-7. Sundar S, Neal RD, Kehoe S. Diagnosis of ovarian cancer. BMJ 2015;351:h4443. Bedner R, Rzepka-Górska I. Diagnostic hysteroscopy after D and C in women with perimenopausal bleeding. Ginekol Pol 2002;73:577-82. Clark TJ, Mann CH, Shah N, Khan KS, Song F, Gupta JK, et al. Accuracy of outpatient endometrial biopsy in the diagnosis of endometrial hyperplasia. Acta Obstet Gynecol Scand 2001;80:784-93. Mihm LM, Quick VA, Brumfield JA, Connors AF Jr., Finnerty JJ. The accuracy of endometrial biopsy and saline sonohysterography in the determination of the cause of abnormal uterine bleeding. Am J Obstet Gynecol 2002;186:858-60. Symonds I. Ultrasound, hysteroscopy and endometrial biopsy in the investigation of endometrial cancer. Best Pract Res Clin Obstet Gynaecol 2001;15:381-91. Lurain JR. Uterine cancer. In: Berek J, editor. Novak's Gynecology. 13th ed. Philadelphia: Lippincott Williams & Wilkins; 2002. p. 1143-95. Wang W, Guo Y. Value of hysteroscopy and dilatation and curettage in diagnosis of endometrial carcinoma. Zhonghua Fu Chan Ke Za Zhi 2002;37:550-2. Nakagawa-Okamura C, Sato S, Tsuji I, Kuramoto H, Tsubono Y, Aoki D, et al. Effectiveness of mass screening for endometrial cancer. Acta Cytol 2002;46:277-83. Nishimura Y, Watanabe J, Jobo T, Hattori M, Arai T, Kuramoto H, et al. Cytologic scoring of endometrioid adenocarcinoma of the endometrium. Cancer 2005;105:8-12. Huang GS, Gebb JS, Einstein MH, Shahabi S, Novetsky AP, Goldberg GL, et al. Accuracy of preoperative endometrial sampling for the detection of high-grade endometrial tumors. Am J Obstet Gynecol 2007;196:243.e1-5. Okadome M, Saito T, Nishiyama N, Ariyoshi K, Shimamoto K, Shimada T, et al. Prediction of histological types of endometrial cancer by endometrial cytology. J Obstet Gynaecol Res 2014;40:1931-9. Kaur N, Chahal JS, Bandlish U, Kaul R, Mardi K, Kaur H, et al. Correlation between cytological and histopathological examination of the endometrium in abnormal uterine bleeding. J Cytol 2014;31:144-8. Yanoh K, Norimatsu Y, Hirai Y, Takeshima N, Kamimori A, Nakamura Y, et al. 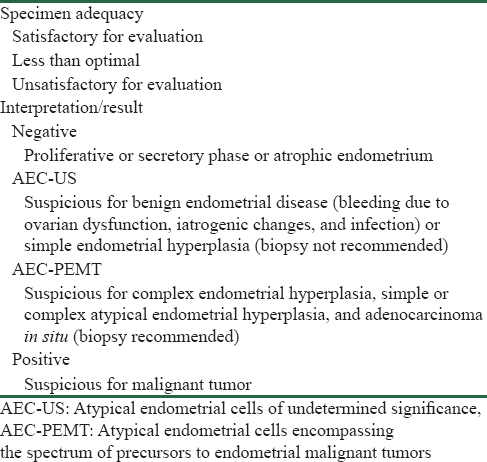 New diagnostic reporting format for endometrial cytology based on cytoarchitectural criteria. Cytopathology 2009;20:388-94.